When you are just getting started with a home gym, you can get away with keeping your dumbbells on the floor. However, this method will clutter your gym and take up a lot of floor space. At some point, you are going to need to get a dumbbell rack. The first thing to look at is the size of the dumbbell rack. Unfortunately, there is no simple answer to “how many dumbbells will this rack hold.” It varies depending on the type of free weights you want to rack. Racks Designed for Dumbbell Sets: Many home gym dumbbell racks are made to hold a set of 5 to 50lb dumbbells (in increments of 5lbs). If you irregular increments of weights, they might not all fit. Rubber Dumbbells Take Up More Space: If a rack says it can hold “10 pairs,” it may only hold 9 pairs of rubber dumbbells. Look At Usable Shelf Width: When looking at the dimensions of a dumbbell rack, it is usually the exterior width that is listed. The actual usable space of the shelves is usually shorter by 2-5 inches. Measure Your Dumbbells! To guarantee a good fit, lay your dumbbells out on the floor. Measure how much space they require. Remember that the dumbbells will need to be distributed across shelves. 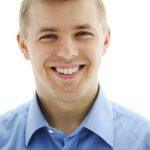 If looking at a 3-tier rack, for example, then you’ll need to lay the dumbbells out in 3 rows to measure correctly. 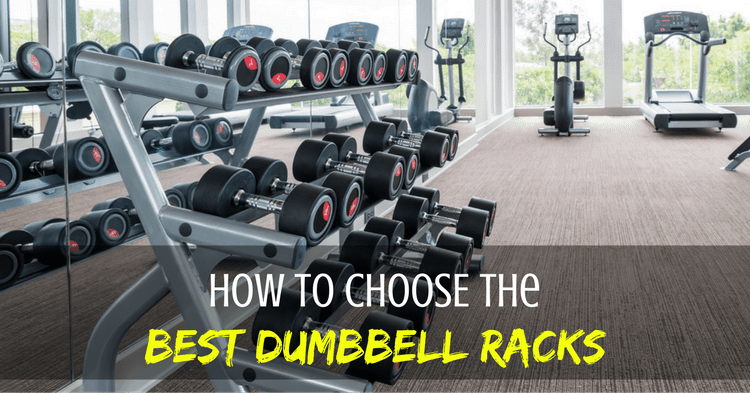 If you just have dumbbells, then choosing a rack should be easy. Things get a bit more complicated if you want to store neoprene weights, kettlebells, or medicine balls on your rack. Neoprene Weights: Light neoprene weights have short handles. These might be too short to fit the gap on some dumbbell rack shelves. Kettlebells: You’ll need a dumbbell rack which has flat shelves. Some racks have shelves which can be installed upside down so they lay flat. Medicine Balls: Smaller medicine balls will usually fit easily on dumbbell racks. For larger medicine balls, pay careful attention to the space between shelves and the depth of the shelves. A lot of home gyms are really pressed for space. Choosing a 3-tier dumbbell rack will help you save space. Pay attention to the amount of space between the shelf tiers. Getting large dumbbells on/off the rack can be a tight squeeze. 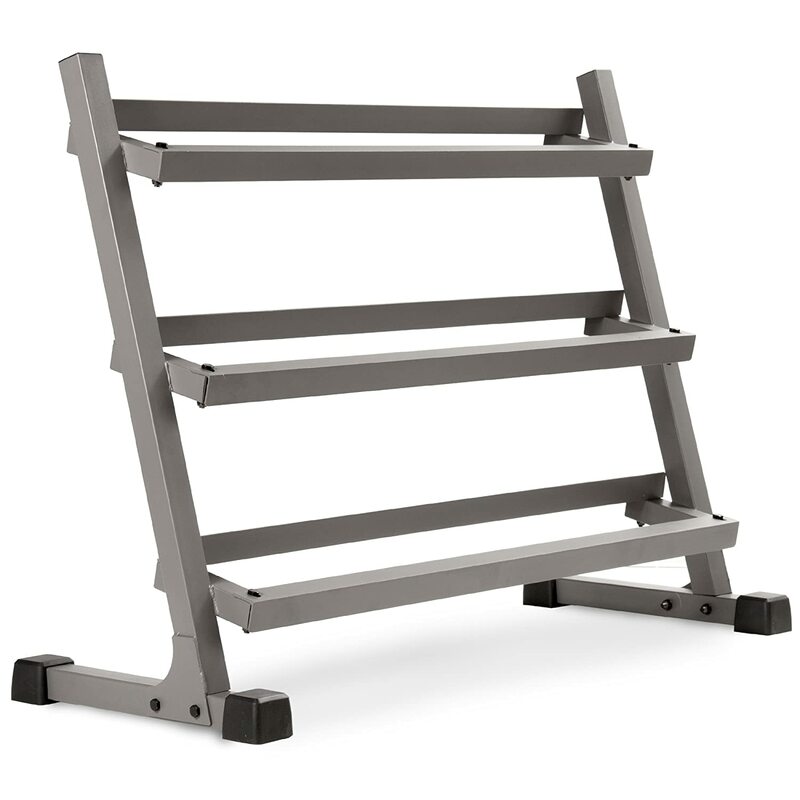 If you want to avoid banged-up fingers, then make sure your rack has a larger gap between racks (more than 10 inches). There are several different types of dumbbell racks, each with their own pros and cons. Tree Weight Racks: These are very small and compact. However, they are usually only suitable for neoprene weights or very light dumbbells. A-Frame Racks: These usually hold about 5 or 6 pairs of weights, though some hold up to 10 pairs. These are very compact but generally not very sturdy and not suitable for heavier dumbbells. 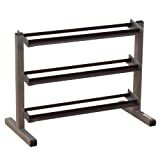 Horizontal Shelves: These dumbbell racks come in various sizes. The horizontal design saves you some space on depth. However, it can be very annoying to rack heavy weights from them as you’ll bang the upper shelf. Staggered Shelves: In my opinion, this is the best design for a dumbbell rack. The staggered shelves make it easier to access your weights. The design is also very sturdy and can accommodate different sizes. The only issue is that they take up a bit more space. Almost all dumbbell racks are made of steel. The best dumbbell racks will tell you the gauge of the steel, which is usually between 3 and 36. Gauge refers to how thick the steel is, and thus how much weight the rack will be able to hold. 14 gauge is a very good quality for most home gyms. You can also find iron dumbbell racks. However, these start to rust very quickly. You’ll have to wipe down your dumbbells before racking them (which is a huge pain). One thing to pay careful attention to is the coating on the dumbbell rack. The coating helps prevent corrosion (even steel racks can rust). It also adds to the aesthetic of the rack. Look at the reviews to see how well the coating holds up against scratches. The price of dumbbell racks ranges from super-cheap at $30 to well over $600. If you are just getting started and don’t have that many heavy weights, you can get away with a cheap dumbbell rack. However, these cheap racks will probably not be suitable for your weights as you progress. Consider how your dumbbell and free weight collection will grow over time. Then choose a dumbbell rack which can accommodate this growth. Spending a bit more now for a rack can really pay off in the long run! Open or Closed Design: Closed dumbbell racks must be installed next to a wall. Open racks can be put anywhere and still have the dumbbells be accessible. Angled Shelves: Angled shelves make it a lot easier to rack dumbbells. However, angled shelves aren’t usually suitable for kettlebells and medicine balls. It also means you’ll only be able to access your weights from one side of the rack. Burrs: Cheaply-made dumbbell racks are poorly welded. There can be a lot of burrs on them, which cut up your hands when grabbing weights. Floor Anchoring: Unless you are prepared to drill holes into your floor, make sure the dumbbell rack doesn’t require floor anchoring! Rubberized Feet: These are great for preventing the dumbbell rack from skidding around. They also prevent scratching of your floor. Unlike most racks, this one was designed to hold both dumbbells and kettlebells. One side of the shelf is flat (for kettlebells). The other side of the shelf has ridges on it for holding barbells. You can install the shelves either way to suit your needs. I do wish that this rack had three tiers instead of two. However, the shelves are deep (23 inches). You can even layer up kettlebells 2-deep. At 39 inches long, these shelves will hold about 4-5 pairs of kettlebells and 4 pairs of hex dumbbells. The welded construction on this dumbbell rack is fantastic. It’s built like a tank and will easily hold over 500lbs. Be warned though that this is a heavy beast at around 79lbs! Best For: People who use kettlebells and dumbbells. For such an affordable dumbbell rack, this one by Marcy holds a lot of weight. It is rated for up to 800lbs. However, since it only fits about 3 to 5 pairs of dumbbells per rack, it’s unlikely that you’ll ever get that much weight on it. I really like the style of this dumbbell rack. It has three tiers to save space. The downside of this is that you might smash your fingers trying to get rack large hex dumbbells. 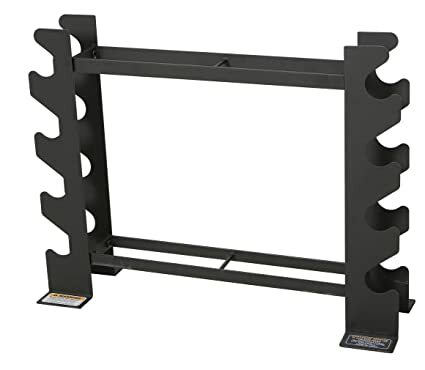 The rack measures 33 (H) x 36 (W) x 23 (D) inches and weighs about 60lbs. The usable portion of the shelves is 32 inches. The gap in the shelves is 4.5 inches. This means they will even fit most neoprene weights. The shelves are angled so you can access your dumbbells easier, though this does mean you’ll want to place the rack against a wall. There’s no need to screw this dumbbell rack into the floor. It has rubberized feet that prevent skidding. Remember that rubber gym equipment needs to “air off” for a bit as the rubber will stink at first. Best For: People who mostly have lighter weights (under 40lbs) looking for an affordable compact dumbbell rack. 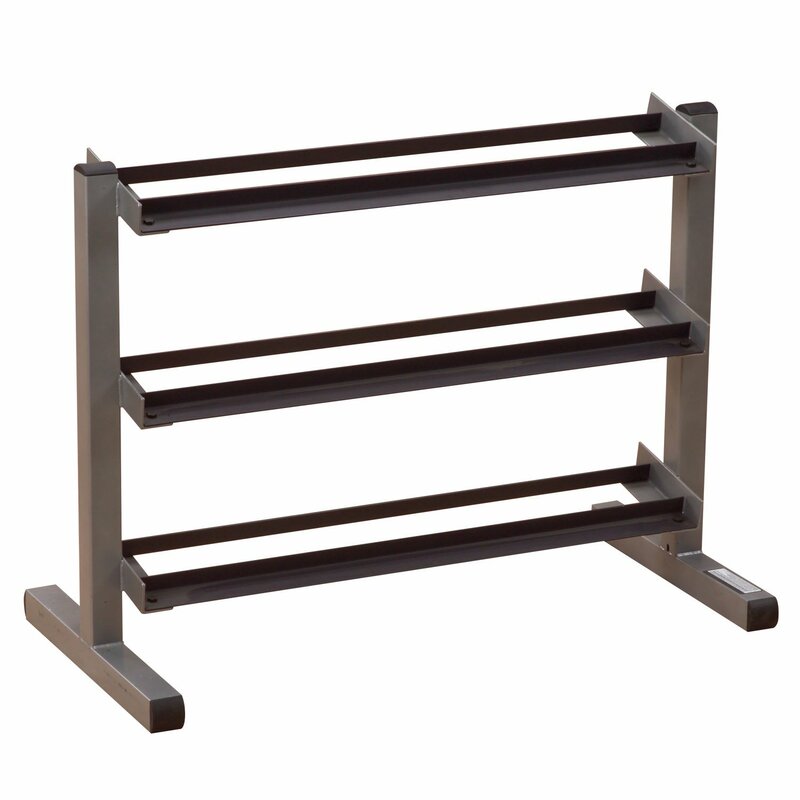 This dumbbell rack is designed to hold the XMARK XM-3301 hex set (5ls to 50lbs). It will also fit other brands of dumbbells though. If you aren’t using hex dumbbells or mostly have lighter weights, then you’ll be able to get many more than 10 pairs on this rack. The dimensions of this dumbbell rack are listed as 53 (H) x 32 (W) x 21 (D) inches. The usable length of the shelves is 48 inches. There are about 10 inches between racks, which leaves plenty of room so you don’t smash your fingers while racking larger dumbbells. The gap in the racks is about 5 inches, which is too big for most light neoprene weights. One cool thing about this dumbbell rack is that you can install the shelves upside down so the flat side is up. Then they can hold kettlebells. It’s not the best solution but adds more versatility to the rack. Best For: People who have a complete set of dumbbells, including heavier dumbbells. 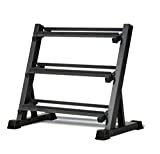 Body Solid is well known for making affordable, high-quality home gym equipment. Their dumbbell rack is no exception. The dumbbell rack measures 30 (H) x 43 (W) x 20 (D) inches. The usable portion of the shelf is 40 inches. It is designed to hold 10 pairs of hex dumbbells ranging from 5 to 50lbs. Note, however, that it will only hold 9 pairs if your weights are rubberized! People who have lighter neoprene weights will be happy that this rack accommodates them. The shelf gap is small so even 3lb weights will fit. The main complaints with this dumbbell rack are its horizontal construction. While it saves you an inch or two, it makes it harder to rack the dumbbells – especially heavier ones. 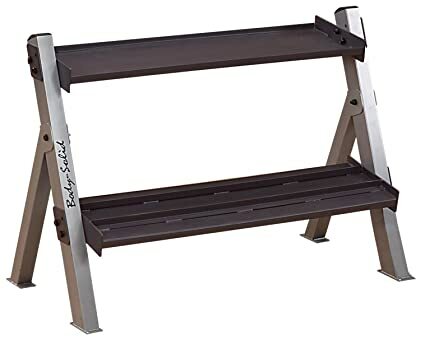 The rack is sturdy but reviewers say that it tends to rust quickly. The manufacturer knows this and even includes a container of touch-up paint. If you use iron dumbbells, you’ll want to wipe them down before racking. It’s also smart to install a rubber protective strips for the rack. Best For: Home gyms that are really pressed for space. Here is another dumbbell rack made by Marcy. This one is a lot different than the Marcy rack reviewed earlier. It has a horizontal construction that allows you to rack dumbbells on the sides as well as on two shelves. When assembled, the dumbbell rack measures 27 (W) x 21 (H) x 8 (D) inches. The usable space of the shelf is 20 inches. You can get 4 pairs of dumbbells on the sides. You can squeeze quite a few small weights on the shelves. You’ll only get 2 pairs of heavier dumbbells (20lbs and up), kettlebells, or medicine balls on the shelves though. This isn’t very much, but enough for a beginner home gym. Best For: Beginners with a small collection of various free weights not going over 400lbs total. For almost all home gyms, the XMARK dumbbell rack is going to be the hands-down winner. It fits a lot more dumbbells than other compact racks and can even hold kettlebells too. 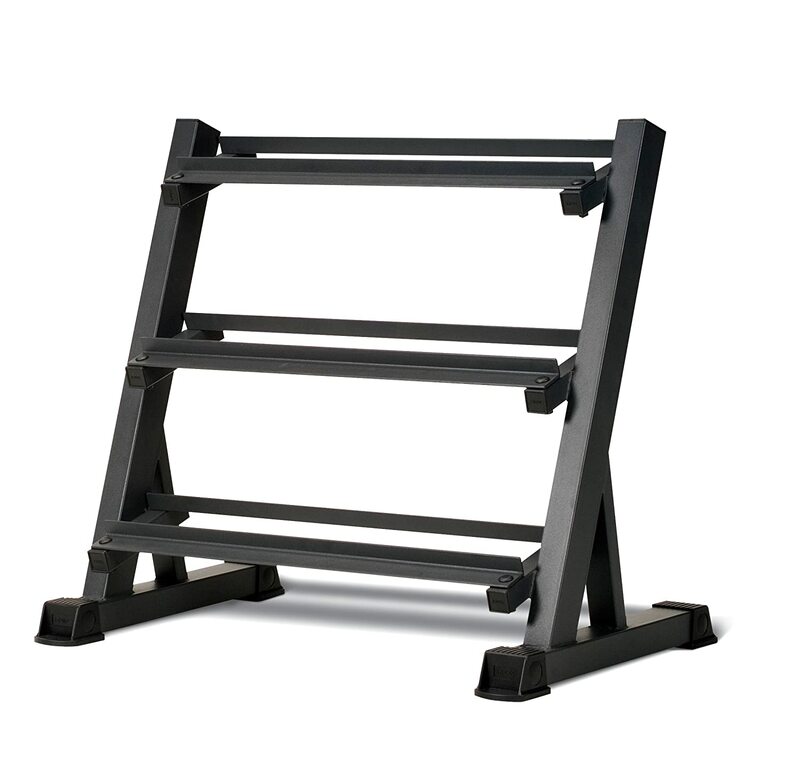 Considering how sturdy it is and its 1000lb capacity, the dumbbell rack is very affordable. 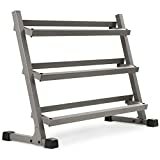 If you need something cheap and basic for a small home gym, the Marcy Compact dumbbell rack is worth considering. However, it won’t hold nearly as many free weights. You’re likely to outgrow it quickly, making the XMARK a better long-term investment.